An upside to modern art history's favoritism of white males? The latent "discovery" of talents who weren't. Two such artists are the focus of the Jewish Museum's show, From the Margins: Lee Krasner | Norman Lewis, 1945–1952, through Feb 1. The genesis of this show came about when the two artists were included in a 2008 exhibition at the museum of work primarily by Jackson Pollock and Willem de Kooning, and their works both stood out and resonated with one another. Krasner, of course, is a more conventionally recognized figure, if often in relation to Pollock, her husband. However, she was established as an artist prior to their marriage, and in fact introduced him to a number of art world habitués, including de Kooning and critic and Ab Ex advocate Clement Greenberg. Who knows what course his career would have taken had she not done so? But her dense, agitated paintings such as Composition (1949)—bursting with small, ordered pictographs that fairly demand, yet ultimately resist reading— and her intricately layered dripped works (such as Untitled, 1948), can be seen in a fresh light in this show, detached from Pollock's magnificent, demanding canvases. Norman Lewis, on the other hand, was unknown to me, a fact which confounded me while moving through the galleries. (If I had caught the Pollock/de Kooning show, I would've been enlightened six years sooner.) Was his relative lack of fame because he didn't hang with the downtown gang, as Pollock did? Or perhaps it was the delicacy of his lines, even though they vibrate with energy? No doubt being African-American contributed to his lack of recognition although his circle included familiar artists such as Romare Bearden and Jacob Lawrence. One work inspired by social causes is included in this show, but his outstanding works are abstract, which perhaps marginalized him as he was more difficult to pigeonhole. In any case, his work is a wonderful, belated personal discovery. Interestingly, many of the paintings in this exhibition, curated by Norman Kleeblatt, derive from series with diminutive titles: Little Image paintings (Krasner), said to be inspired by her study of Hebrew, and Little Figure works (Lewis), which refer to African-American culture, including music. 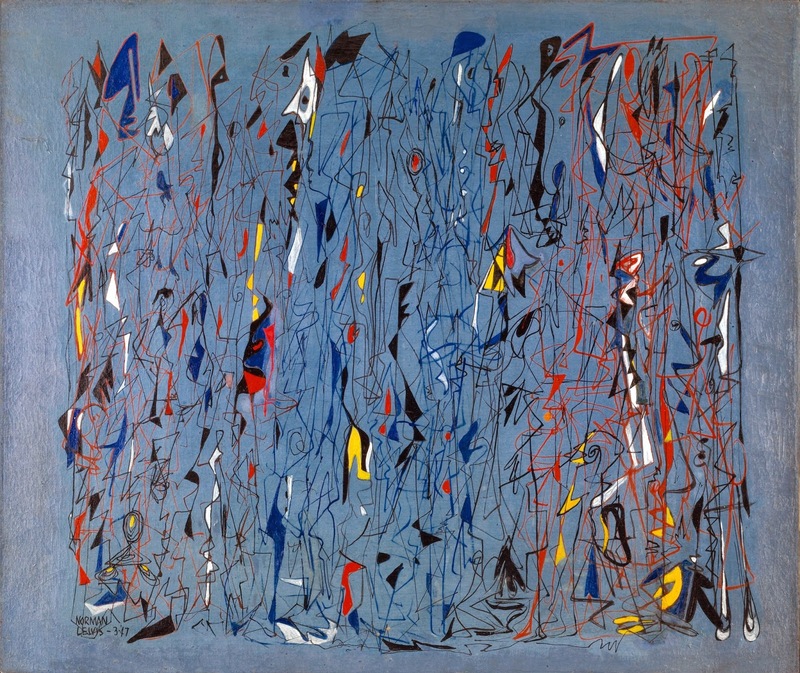 One of Lewis' major paintings on view is, in fact, titled Twilight Sounds (1947), which causes a modestly jarring conceptual disconnect. How does one depict sound? His vertical subjects resonate with the sense of fitting together, the way a band of musicians fits together visually as well as audibly. His compositions almost always surround the subjects with a wide border of color, isolating them and pushing them into focus. They are beautifully balanced, weighted like complex chemical compounds floating in space. Krasner tended to fit shapes just into the frame, or extended them past the edge, indicating an endless vista, a broad and busy universe. Several works show her experimentation with composition and technique—large organic shapes, or rectangulars spaced rhythmically, like paintings in a museum, or windows in building. The dense layering and scumbled pigment on her canvases tell of an inner life bursting at the seams, waiting to emerge. The Jewish Museum should be congratulated for bringing to light the work of these two artists essential to modern art. And who knows what other marginalized artists are waiting to be rediscovered?